Since last we typed, I caught a virus which lead to an ‘exacerbation’ – basically, my asthma got uncontrollably worse due to the inflammation caused by the virus that had moved into my respiratory system. I’ve been on prednisone and a couple of new puffers in order to reduce the inflammation, and I am happy to report that I am *finally* seeing some improvement. I can breathe much better than I could last week, and though I am still coughing, it isn’t quite as all encompassing an experience as it has been. I can make it from the couch to the kitchen without gripping furniture for support (the shortness of breath has been off the hook) which is nice, and I actually managed to eat solid food yesterday. Yesterday was the first ‘close to human’ I’ve felt since the virus hit on the 5th of September, and I pulled out a limited palette of things to play with in order to remind myself that I *could still paint*. Believe me, after ten days of doing nothing but moving from bed to couch to bed again, one can forget what one is made of, and that was definitely my experience. I came into the studio and put on a movie on the lap top (Eat, Pray, Love), pulled out a journal a friend made me years ago, and made a solemn vow to myself that I would not judge the outcome. I would just *play* for the sake of playing. I reached for whatever delighted me (in this case, fluorescent pink paint, turquois pthalo, black pen, pink and blue Tombow markers, gold paint, a stencil, a couple of Faber Castell Pitt Pens, and a white paint marker) and I just made stuff for the sake of making stuff. It was like getting reacquainted with my inner artist, who had been hiding in a blanket fort under a pile of Vicks scented Kleenex. Oh, hello. Are you still in there? Think you might want to come out and play? Painting while under the influence of NyQuil is really interesting. There’s something about this stuff that depersonalizes me – meaning, I don’t feel like myself at all while I’m on it. I feel like I’m outside of myself watching myself. It is very difficult to get in touch with what’s happening on the inside of the equation. Numb is a good descriptor, along with foggy, and pretty much ‘out of it’. Still, the flinging of paint without caring about outcomes let me reach through that fog so that I could shake hands with myself once more after ten or so days of being relatively unknown to myself. It was a bit like an archeological dig. Oh, yes. There I am, under the rubble of exhaustion and an overwhelming list of blown deadlines. There I am, still complicated as ever, still grappling as usual, still half bewildered and half determined, still somehow *here*. I know that in the big scheme of things this ten day ‘down and out’ experience of mine is no big deal. I was able to adjust things, tweak things, beg off, switch out. I survived. My business survived. But it is *scary* when something like this happens and you have absolutely no control over it. There are no sick days to call in. There’s no one to pick up the slack. It’s just you and this alarming new normal wherein two hours of upright are too many, and you can forget about painting or writing anything coherent. You’re lucky if you can make tea. It’s made me think. Made me wonder how I can create a life in which there is time for the inevitable frailties of the body. Made me miss being partnered up so that when the chips are down, there’s someone there to change the sheets and make the soup. Made me question the way I schedule myself down to the very last second of every single month, week, day, hour. In the meantime, there is this amazing Creativity and Wellbeing Summit being hosted by Tamara Laporte of Willowing.Org, and I am going to be a part of it! I hope you’ll register. Participants get free access and all sorts of lovely bonuses, so I hope to see you there. And that’s me for now, on the mend. “One At A Time” Mixed media on paper. Today, I want to offer you up some writing I did for Moonshine for the month of April. It feels good to be writing the way I’ve been writing for this program, and all feedback I’ve gotten has been super positive. I hear it over and over again, every time a new monthly PDF comes out, that the content is way more than anyone bargained for when they signed up. You can imagine how ridiculously happy this makes me. April’s theme is “You are the storm” and we are exploring the idea of building resilience by *being with our feelings* instead of stuffing them, ignoring them, downplaying them, or tidying ourselves for ‘public consumption’ even when we are in private. It felt especially powerful to be writing about this in Spring, when the earth gets super messy. SUPER messy. Everything springing to life all willy nilly, mud everywhere, rain bruising tender shoots of green while nourishing them. April is a particularly messy month for me, personally, too, since it includes within its calendar pages a particularly painful anniversary. What were we thinking, calling April Fool’s our anniversary? It’s a little like calling your child “Kali” and then coming up all surprised when she’s a total hell cat of a kid. Anyway…I have been in the storm for grief for four years now, and in that time, I’ve had to befriend uncertainty, learn to be with grief in a fully embodied way, learn to tell the truth through tears more regularly than I’d like. I *could* have just cut him off entirely. I could have just amputated, and left the limb of our love wither and die. It might have been easier. It might have been a more ‘reasonable’ thing to do. But it wouldn’t have worked for me, because whatever there was of love between us was (and is) still in the thing, and I felt a spiritual imperative to preserve that part, to work through the rage, the sorrow, the death of what was dying without killing it all once and for all. I may regret that. I don’t know. I know I’ve gotten a lot of judgement over these past four years about it all. What am I doing hosting him at my house every Friday? Friday is date night. Friday is for lovers. Why can’t I just get over it? Why am I still hanging on? Why do I give so much to someone who could *never show up*? What was wrong with me? Well, nothing. I just don’t do endings the way I’m ‘supposed’ to, I guess. I navigate them by a different set of coordinates. I am not looking to get out from underneath the pain by any means necessary. I’m looking for metamorphosis, for alchemy. I’m looking to renegotiate terms and turn longing and desire into something that no longer turns itself on me and burns me to a crispy fried Goddess Of Never Not Broken. And it’s working. I mean, I think it is. My therapist seems to agree. I have let this grief work me, work through me, work me over. I have let it shape my body, my face. I’ve learned new love languages. I’ve learned to love without laying claim, planting a flag of ownership, possessing a person. I rode the storm, and now I am the storm. Anyway, here’s the PDF from Moonshine for April. May it serve you well. Every year, twice a year, once in April, and again in September, I blog every day for a month, and invite others to do the same. We have a Facebook group, and in that group the only rule is that for every link you post to your own blog, you go off and read three other blogs and leave a comment. This is simply a way to ensure that a community happens rather than just a ‘promo’ group. You’re welcome to join in as long as you are willing to read and comment on three blogs for every blog you post. Click here to join us! If you’re too busy for that, you’re welcome to just blog on your own for a month. Easy peasy. No one is keeping score. There are no prizes except that you get to build your own readership by regularly populating your blog with good content. To read all my entries for the Blogalong, please click here to access the Blogalong With Effy Category on my blog. I bought this super cool art bin a few month’s ago while out for lunch with my friend, Sal. She and I hit up Curry’s, as we often do, and this bin called my name. I thought I might do some kind of traveler’s kit with it so that I could indulge in some ‘out of the house’ art adventures, but you know what happened? I brought it home and didn’t look at it again.It got put on top of a very high bookshelf because I had zero room for it anywhere else, and I totally forgot it existed. A few months after, Sal and I were out for lunch again, and this time, we hit up Micheal’s. I picked up some stuff for my BuJo – some stamps, stickers, and a few other things – and I said “I have no idea where I’m going to put all this stuff. This BuJo thing is getting out of hand!” and she reminded me of the art bin I bought months ago. My BuJo Bin got put together that very afternoon, and I’ve been using it ever since. Before: I kept everything in a large tote bag and just dumped it out when I wanted to play. After – Ahhhhhhhhh. Both my inner child (who has always loved boxes of things like this) and my inner Libra are verra verra happy with this. So, without further ado, here is a video walk through of my Sweet Trash + Bujo Journals, My new Tarot Journal, and My Bujo Bin! Enjoy! I’ve added the BuJo stuff to the Sweet Trash Journal Class I produced (for free!) last year! You can have the whole class if you like! Just click through this image to register. Ready for 2018? Get Journal52 two ways! Every week in 2017, you will receive a new prompt card from Effy Wild. Designed to jump start your next art journal spread, these cards are printable for your future use as well, so you can expect to collect 52 cards by the end of the year! Each card comes with a word, definition, synonyms, art prompt, and ‘oracle prompt’. You can copy/paste this information for your own records, and use it & the card in meditation, or in written or art journaling as you see fit! Want to commune with over 11 100 art journalers? Join our Facebook Group Here! Want Journal52 in your inbox? Click here to get RSS to e-mail. “This week I’m working with the prompt “word” from Effy Wild’s Journal52 <linked to http://journal52.com>. You can find the prompt and art card here. <permalink to the post for that week.>. Please don’t lift the cards or written prompts from my website to share in your own spaces. Direct folks to the original post at journal52.com so they can find it themselves. Set free from restraint. Let go. Relief or deliverance from sorrow, suffering, or trouble. The state of being freed. Emancipation, liberation, unbinding, unchained, unfettered. Consider what you’d like to release and leave behind. Create a spread that expresses the sense of relief and release you might feel when you let go. What needs to be released? What are you most wanting to let go of? What might come about if you release control, expectations, what no longer serves you, or what binds you? As usual, do what you want, and use what you have! And check out the news regarding Journal52 in 2018 by CLICKING HERE. And here’s a freebie for you to see you through the long dark winter! Blog Hop & Giveaway! WINNER ANNOUNCED! Hello artsy clan o’ mine! I am so excited about this, y’all!! 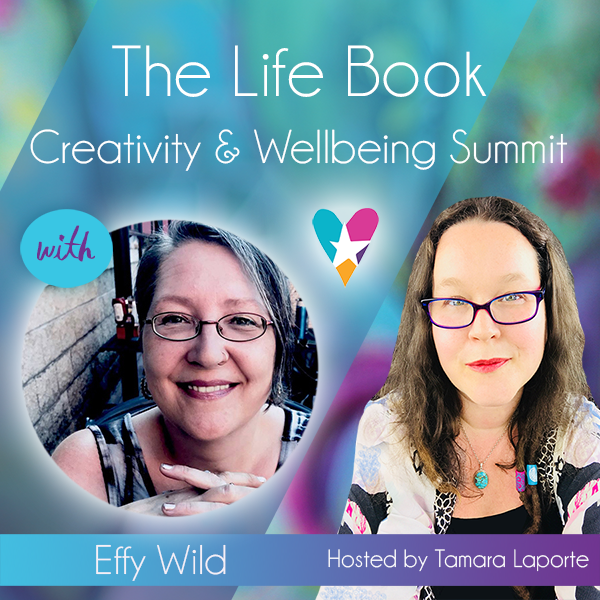 Tamara Laporte from Willowing Arts has written a book called ‘Create Your Life Book: Mixed-Media Art Projects for Expanding Creativity and Encouraging Personal Growth’ and a) I’m IN THIS BOOK and b) I get to give away a copy! Based on much-loved mixed-media artist Tamara Laporte’s popular, multi-year series of online classes, Create Your Life Book offers mixed-media drawing and painting projects that can raise your awareness of and help you work through personal challenges and other obstacles to creating art and achieving self-fulfilment. Each themed chapter presents 4 or 5 two-part projects: The first part of each project explores a common issue that hampers creativity and/or positive self-worth, and includes a worksheet or list of questions to be answered; the second part is a step-by-step mixed-media art project that provides a way for artists at all skill levels to contemplate and work through that issue. Also included are projects contributed by some of Tamara’s Life Book guest teachers–Roxanne Coble, Andrea Gomoll, Alena Hennessy, Mystele Kirkeeng, Ivy Newport, and Effy Wild–who are noted mixed-media artists in their own right. Along the way, Tamara shares inspirational photos and uplifting and encouraging affirmations. The final chapter presents a simple binding method for creating a keepsake book of your Life Book projects. Did you read that bit there where it said Effy Wild is a noted mixed media artist in her own right? EEP! I about fell out of my chair. :D Yes, I’m in this book with a project about reframing your story, and creating it for you was one of the highlights of my life! CONGRATULATIONS SHANNON! I’m sending your info on to Tam so she can get you sorted out! P.S. You can get Life Book 2018 with early bird pricing if you sign up before December 31st! Life Book now comes with forever access (so no more year end panic to download) AND all students get instant access to a swag bag full of delicious bonuses, like high res prints, whole e-courses, mini classes, and more! The Business of Art – Free! One of the things that helped me the most when I was first starting my creative business was learning from my peers. Any time an artist or teacher that I admired released a blog post or program about how they do what they do, I jumped on it. I probably spent in the neighbourhood of a thousand bucks in my first year of trying to navigate this whole ‘teaching on line and making a living with my art” thing! Well, there’s this eBook out now, and it’s way less than a thousand bucks. It’s FREE, Y’all! If I’d had this resource, I would have been over the moon! AND I’d have had more money for paint! Download the new, expanded “The Business of Art” Ebook and get interviews with dozens of professional artists who share their advice on building a career out of your passions and give practical advice on improving your skills, teaching courses, selling merchandise, marketing and more. The Business of Art is available as part of the second Art Bundle for Good coming on December 6th. The first Art Bundle was a massive success, and this bundle is bigger and better. I bought the bundle last year (because there were so many artists I wanted to learn from featured in it) and this year, I’ve been invited to participate! YAHOO! There are thousands of dollars worth of courses, resources, ebooks, etc. on topics like, painting, drawing, mixed media arts, digital illustration, creativity, marketing your art, and more all bundled together for one low price for 5 days only. It’s a fantastic deal that will definitely take your art and creativity to a new level. The best part is that 25% of the Art Bundle for Good profts are going to support Courageous Kitchen, a Bangkok based charity helping refugees. The Art Bundle for Good is a great opportunity to get dozens of top art learning resources from many of the biggest names in the industry and do some good. Check out the website and sign up to get the free ebook. I’m sure you’ll love it!